My name is Chef Savoy and I'm a master pastry chef. I heard you enjoy baking and want to become a pastry chef yourself. I will guide you, but it's up to you to complete the journey. You have a long road ahead of you but I can already tell you're going to do a great job. Remember, it's the journey that's important. We need to complete match 3 levels to gain gold to purchase pastry recipes. You will build up your bakery along the way. I will be chcking in on you throughout your progression. 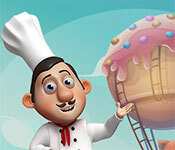 This game has a free trial version, click to start Sweet Treats: Fresh Daily Free Download. If you like it, please buy the full version to support the developer, thanks. Sign-up to get informed when the Sweet Treats series has new game released with BD Studio Games' FREE bi-weekly newsletter.